Just for a change, Doug has started ordering us a weekly organic veg box to experiment with. Believe it or not, it’s the first time we’ve ever signed up to a veg box scheme – mainly because for years we had our own homegrown stuff to eat from the garden in our old house in Essex. But now that we’re renting in Hertford (the house hunting has yet to be fruitful…) and the allotment isn’t productive yet, we no longer have our own lovely homegrown organic veg to enjoy and we miss it. The ‘gourmet box’ we’ve signed up to is £16.60 a week including £1 for delivery. It might sound a lot, but after going through our monthly spend recently and looking for ways of trimming it again, we realised we were spending this or more each week on the same old boring veg at the supermarket anyway. We’d like to eat more seasonally and support farmers in the UK who care about the way our food is produced – especially after all that’s been going on with the horse-meat scandal – at least until Doug’s plot at the allotment is in production later this year. We’re also trying to eat less meat during the week to save cash, so the more interesting veg we have, the more we can experiment with our meals. This is a photo of our first one from Abel & Cole. It sounds daft, but it was quite exciting when it turned up on Friday morning a couple of weeks ago – a bit like Christmas. We couldn’t wait to open it up and see what was in it. There was celery, broadbeans, cherry tomatoes, spring onions for Doug (I discovered a couple of years ago that I am intolerant to all aliums, which is a nuisance…) and a pak choi among other things, but also some more unusual things like kohlrabi and chioggia beetroot (which embarrassingly I failed to identify when I opened the box). Doug ordered the gourmet box, which features some more offbeat stuff in it, because he thought it might be interesting for us to try out some more unusual vegetables. This week we also got some bleu d’auvergne potatoes – crazy-looking things which are purple inside and out – and some Jerusalem artichokes. We have tried Jerusalem artichokes before but not for a while, so I’m looking forward to eating them again. Helpfully you do get some guidance on what to do with the more unusual veg, in the shape of little leaflets in the box and then also recipes on the company’s website. The kohlrabi baffled me a bit. It’s a cabbage-like vegetable that, frankly, resembles an alien but is also said to be like a turnip. It’s a perennial brassica and apparently its name actually means ‘cabbage turnip’ in German. In the end, I cut it into cubes and roasted it with the potatoes. Some of it got a bit burnt, so next time I’ll do bigger cubes – or cook it separately from the potatoes – and I’ll also peel it. Doug advised me not to bother, but on eating it became obvious that this was in fact necessary. It has an interesting, slightly turnipy and slightly spicy flavour to it so I’d definitely eat it again. Meanwhile, looking forward to what next week’s box will bring. If you’ve got any good recipe ideas, then let me know! 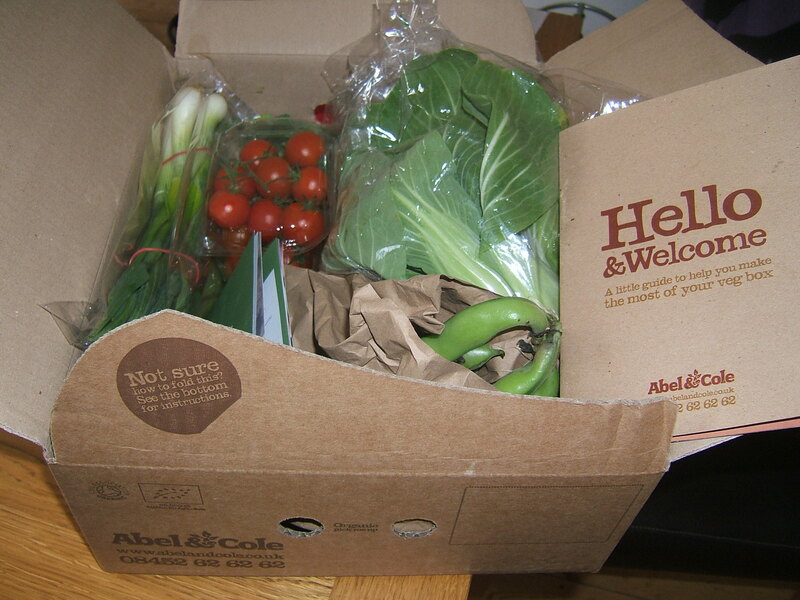 This entry was posted in Food and drink, Green living, Uncategorized and tagged Abel & Cole, growing your own veg, organic vegetables, veg box. Bookmark the permalink.